University of Maine's Rachel Harvey connects with a pitch from University of Massachusetts Lowell during their softball game at Kessock Field in Orono on April 9. 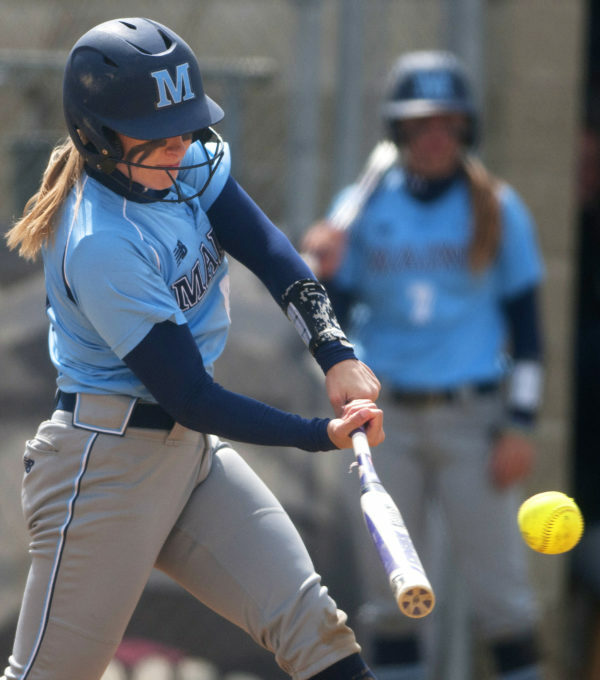 ORONO, Maine — Two University of Maine softball players, senior catcher Rachel Harvey and junior pitcher Annie Kennedy, have been suspended by school officials for an incident at the Orono House of Pizza on Saturday night. According to an Orono Police Department report, Harvey and her father, William Harvey, were charged with assault and disorderly conduct, as they allegedly were involved in a physical altercation with other customers in the establishment. They were summoned, but not arrested, and then released. Orono police Sgt. Scott Lajoie said Kennedy was listed as a witness on the police report but indicated that more information may be coming. “We got a complaint about a fight in progress out back in the bar area at the Orono House of Pizza at about 10:45,” said Merrill. “As a result of the investigation, Rachel and her father were both charged. They will have a forthcoming court date. “We’re looking into speaking with other parties and additional charges may be assessed to other people,” he added. Margaret Nagle, senior director of public relations and operations at the university, said in a statement released via email that the university “has been informed that two student-athletes were allegedly involved in separate altercations this weekend at a local business. The suspensions come right before the America East Tournament at Binghamton University in Vestal, New York. Defending tourney champ UMaine is the second seed and received a first-round bye in the double-elimination affair. The Black Bears will play the winner of Wednesday’s game between third seed Stony Brook and sixth seed Hartford on Thursday at 1:30. Harvey, a native of Southington, Connecticut, was a second team All-America East selection a year ago and is the Black Bears’ second-leading hitter at .311. She is second on the team in hits with 38 and had a 13-game hitting streak in which she hit .422 (19-for-45) and keyed a 13-1 stretch by the Black Bears. She started 37 of the Black Bears’ 39 games behind the plate. She has stroked four doubles and two homers, driven in 20 runs and scored 18 runs. She has eight multi-hit games. Sophomores Maddie Decker and Ashley Tinsman were the other two players who caught but Tinsman can’t play due to an arm injury, according to Coutts. “Maddie hadn’t caught since her junior year in high school, but Meghan Royle did quite a bit of catching in high school. We’ll figure it out,” said Coutts. Royle, a sophomore, has been the team’s starting right fielder. Kennedy is the Black Bears’ primary reliever and has posted a 5-3 record to go with a 4.05 ERA and a team-leading two saves. She has appeared in 24 games, 19 in relief, and has 30 strikeouts and just seven walks over 67 1/3 innings. She has given up 91 hits and has two complete games. Erin Bogdanovich and Molly Flowers have been the starters and Coutts indicated senior Nikki Misner could also see some duty.